Dozens of activists were arrested on Thursday in Cairo, Alexandria, the Nile Delta and Upper Egypt ahead of planned protests on 25 April. The police raided several Cairo cafes and arrested dozens of people late on Thursday night and in the early hours of Friday morning, according to a statement by the Freedom for the Brave campaign. Lawyer Amr Imam told Ahram Online that at least 100 people were estimated to have been arrested around the country on Thursday night. The prosecution ordered on Thursday the detention of activist Yasser El-Qot for four days pending investigations on charges of calling for protests overthrowing the regime and distributing flyers to protest on 25 April, judicial sources told Ahram Online. The South Cairo prosecution has also ordered the summoning of activist Sana Seif, sister of jailed blogger Alaa Abdel-Fattah, for a hearing session on 27 April on the same charges. 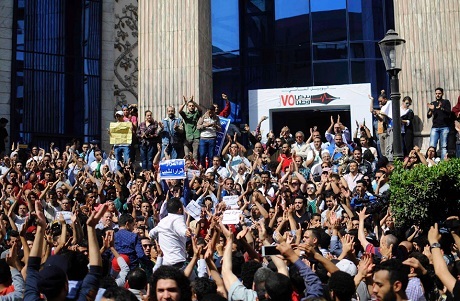 Last week, several thousand protestors took to streets to oppose the government’s decision to acknowledge Saudi Arabian sovereignty over the Red Sea islands of Tiran and Sanafir. They had vowed to stage another protest on 25 April, which is Sinai Liberation Day. "We don’t know what the fate of those activists and journalists who were arrested on Thursday night is and we don't know where are they now," said Imam. The human rights lawyer said that in Cairo at least 56 people were arrested and in other governorates authorities raided houses and arrested some other 45 people. Among those arrested according to Imam, were activists Haitham Mohamadein, Saied El-Banna and Mohamed Mostafa. Some cartoonists and journalists who were among those arrested but were released on the same day have documented their testimonies, saying that security forces had totally refused to give the reason for their detention. "It was a depressing experience, sad but not cruel. We were arrested from a downtown cafe, they held us for a few hours and left us without a word. It is not fair, they let us go because we are known, while others who are less lucky and have nothing to do with politics stay in jail," said Al-Masry Al-Youm cartoonist Makhlouf in a Facebook post following his release early on Friday morning.